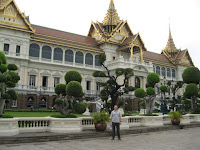 On the all travel guides it says that one of the main attraction in Bangkok is the Grand Palace. So I went there, only to find out you can see it only from outside. 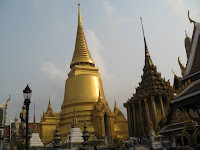 But you do pay to see it, in combination with a temple - Wat Phra. I would say it was interesting to see it, but because me and religion are not close friends, I didn't feel anything divine (I guess it might be something wrong with me). 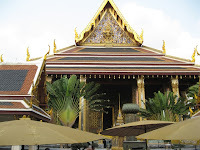 It was more like a curiosity, and also interesting architecture and decorations. 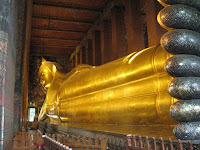 I also went to another temple - Wat Pho, which contains a huge reclining Buddha. 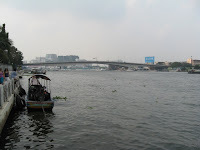 Having few hours before the bus departure, I took the Chao Phraya Express boat down the river (at least on the map, as I have no idea which way was flowing) and the took the skytrain somewhere it looked like downtown. I walked for about an hour, ate something that again I have no idea what it was, but was tasty. I came back to KhaoSan (if I didn't mentioned till now, it is the Mecca of backpackers - cheap accommodations convenient located). 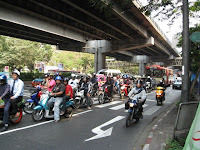 To my surprise, the buses to Krabi were also full. I am starting to think there are way too many tourists. The Europeans are the most, by far. As for the age, the 20-25 years old group are the the biggest percentage. I saw a movie in the bus and then I tried to sleep. Even though the seat reclined, it was just awful. I though it's gonna be a nightmare. An hour and half later, after the first bus stop, my head and my neck were hurting me. I took a towel out of the small backpack and I rolled it and put it around my neck. It made all the difference. It must have been my big heavy brain! I think I did get 4 or 5 hour of sleep, I even dreamt some weird stuff.